hristian Olsen in Denmark was Parker's first subsidiary outside the US, dating back to 1903 when George Parker persuaded Olsen in Copenhagen to sell his pens. By 1935 Olsen was also manufacturing his own Parkers for the Scandinavian and other European markets. Outside the Duofolds Olsen (who also manufactured his own brand "Penol") produced but a few models. One of which was the Parker "VS" (Vacumatic Successor). 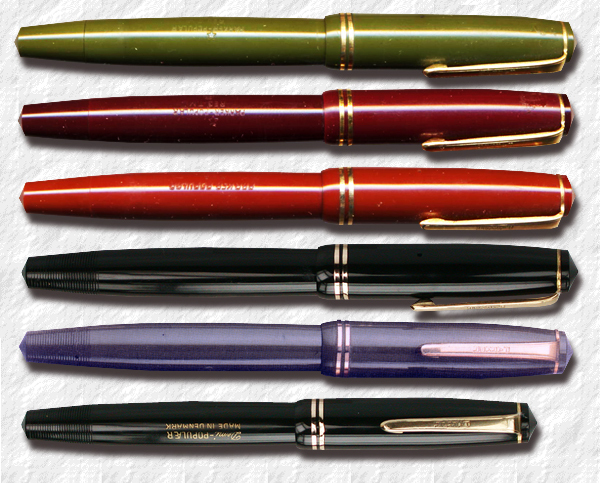 Parker was working on an open nibbed pen as an option to the hooded Parker "51". The Parker "VS" was introduced in late 1946. It turned out that it sold better in Europe than in the US and soon the model was also being manufactured by Christian Olsen in Denmark. The Parker "VS" looked very much like the Parker "51", at least externally. But inside it sported the open 14K nib and had an aluminium button filling system, as opposed to the Vacumatic filler of the Parker "51" of the time. Still the Parker "VS" seemed never really to catch on. Late in 1948 the aluminium filler — following the Parker "51" restyling — was replaced with the aerometric filling system, but to no avail. In 1949 the Parker "VS" was discontinued in the US. The Parker "VS" did however continue to sell well in Europe and Olsen instead re-launched the VS, Mark III, with the new body imprint "New VS". nother Parker model, also produced in Denmark, was the Parker Victory. The Victory had been around since the early 1940's in different shapes and colours. The Victory MK IV, also introduced with the aluminium filler in 1948, was a standard length pen, (130 mm), it was somewhat streamlined and featured a new tapered Parker clip in the style of the previous Challenger and Parker "VS" designs. The cap had two capbands. n 1948 Olsen decided to offer a cheaper version of the Parker "VS" aiming for the Scandinavian economy market. He based the new pen on the Victory MK IV and named it the Popular. It was imprinted "Parker Popular REG.T.M" on the barrel and sported a 14K gold nib. Imprints also exist with the Danish spelling "Populær". The clip screw and blind cap were of the same colour as the rest of the pen and some items have circles on the blind cap for better gripping. It was a plain button filler and the plastic was decidedly cheaper than that in the "VS". Especially the cap is prone to shrinkage; hence there are a lot of Populars out there with loose or missing cap rings. Following the UK Victory design (MK V), the Popular was fitted with the aerometric filling system in 1953. As was the complete line of Duofold pens in the UK. A new, shorter model, the Demi Popular was also introduced in 1953. The Popular models were however discontinued soon thereafter when Olsen began production of the very successful UK aerometric Duofolds. In 1966 the Olsen factory at Emdrupvej was closed down. The production of Danish Parkers ceased, and the Penol brand was outsourced to manufacturers all over the world, primarily in South East Asia, and Europe. Christian Olsen remained a distributor for Parker until the company was sold to Gillette in 1993.